If this plugin is useful, could you please help us to rate it? it will be a big encouragement to improve for us. 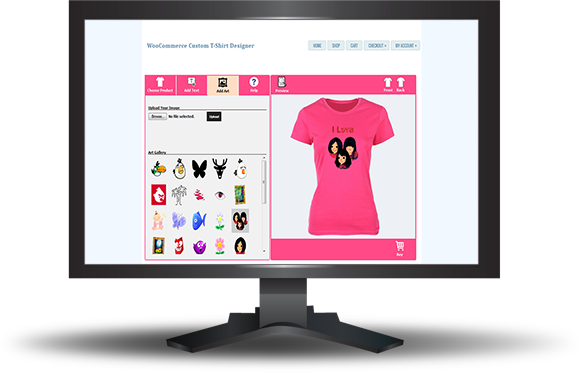 “WooCommerce Custom T-Shirt Designer” plugin is a WordPress Woo Commerce Plugin which is used to design or customize T-shirts. By this plugin customer can design the t-shirt as per their need such as add Text, Number or Logo by different Font Types, Color, Font Size, Alignment and many more. Customers are able to design their own t-shirt and they can upload logo or image to any position of t-shirt or can select existing logo from the sample items. Customers can add normal text or curved text and can rotate the text in any position. Customer can view the preview of T-shirt as designed. Frontend design is fully customizable from admin. 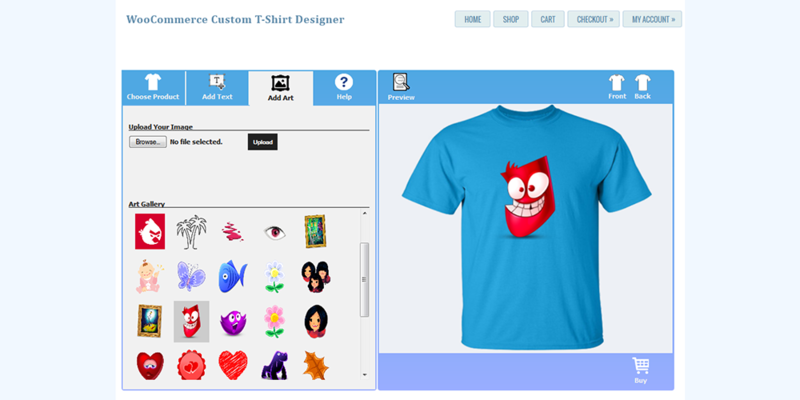 “WooCommerce Custom T-shirt Designer” plugin has excellent features and very easy to install or setup. 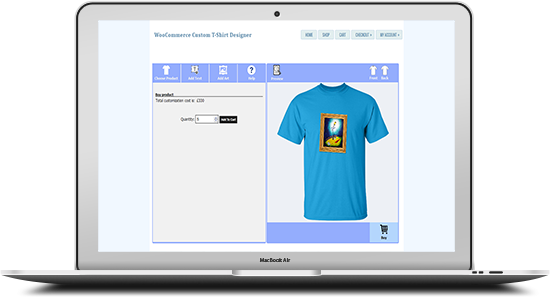 “WooCommerce Custom T-shirt Designer” plugin is more flexible and compatible with many existing plugins in the WP repository. This Plugin is fully customizable. Users can easily configure the plugin into the new or existing WordPress WooCommerce sites. 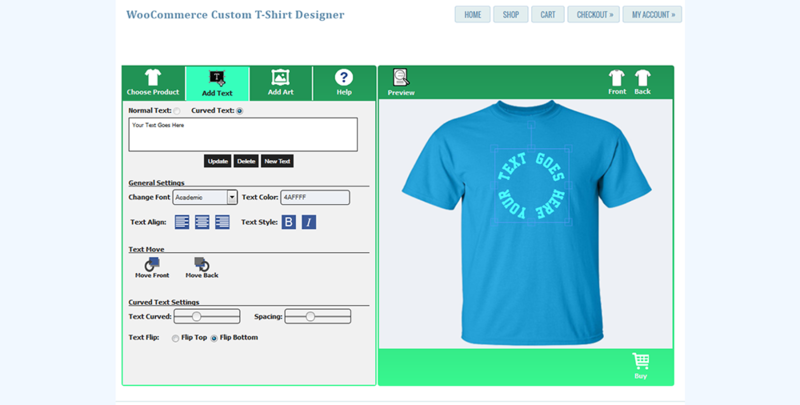 Shoppers can Upload their own Design/Image/Logo to print on T-shirt while shopping. Add Text or Number on the t-shirt product. Just chose a product and start design. Design can be possible for front and back of the T-shirt. Can select an Image/logo from the existing logo/images to put on the t-shirt. Normal and curved text can be added to the T-shirt. Change the text Font, Color, Alignment, and Style of the Text or Number. Text or Image can be swap. Place Text or Images in any Positions of the t-shirt. Text and Image can be Drag, Move and Rotate. Shows Preview mode of the T-shirt as designed. Shoppers can add to cart with quantity from design panel. Fully customizable template from admin. Admin can customize templates all color such as Background Color, Content Color, Menu Default Text Color, Menu Selected Color, Menu Selected Text Color, Menu Border Color, Product Selected Color, Content Text Color, Content Text Border Color with Gradient. Admin can change “Button Settings” like Background Gradient Start Color, Background Gradient End Color, Border Color, Border Radius, Font Size, Font Family, Padding Top, Padding Bottom, Padding Left, Padding Right, Text Color, Background Gradient Start Color (hover), Background Gradient End Color (hover), Border Color (hover), Text Color (hover). Admin can change all Text of the plugin from “Localizations” section. Can set the plugins “Help” text with html editor. Can customize “Customization Cost Text” from admin. Admin can upload “Sample Logo” from Art List > Add New Art section. Admin can Enable or Disable design panel for a particular product. Extra price for custom design can be set from admin metabox area. Upload T-shirts back image from admin and front image can be uploaded as featured image.